Createspace Independent Publishing Platform, 9781537658575, 32pp. 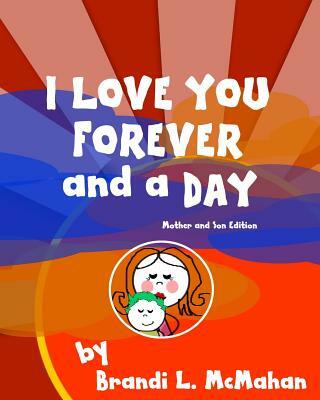 Teach your child about shapes, colors, days of the week, months, and seasons of the year with this adorable book about a mothers love for her child. Most importantly teach your child about how despite the rules that seem unfair, why we have them and how they are another way we show how much we love them. Sometimes parenting can seem mean, and setting and enforcing rules is hard on us too. We want to give our kids the world while still shaping them into decent human beings I hope this book will be another way to remind your child just how much you love them and that it's your job as a parent to not only love them, but to also teach them and protect them. Brandi McMahan is an East Coast native from Virginia living in the Outer Banks of North Carolina with her son Ethan and husband Eric. She enjoys the creative arts including photography, crafting and writing. More than anything she loves being a mom to her young son. The idea for this book came to her one night when he was two years old and she was tucking him into bed. He said to her "Mommy I don't ever want you to be mean" and her reply was "I'm sorry I sometimes have to enforce the rules but I always love you." She kissed him on the head and then the words came to her as he drifted off to sleep. Her visions of a whimsical and colorful children's book quickly took shape.